Bringing in fabric backgrounds is easy to do using StitchArtist. Although this may sound like an advanced function, it is an included feature in StitchArtist Level 1! In fact, the zipped file that you can download from this blog post contains instructions on how to add images of your fabric to the design and save an image from the software. As we often do, the BE working file of this design is included in the zipped file. For those that do not have StitchArtist, you can open the BE file into your Embrilliance software (even our free Express version!) and save to your format using the File > Save Stitch File as to get the file you need for your machine. For those that do have StitchArtist, you are in for a treat! An effective way to learn how to digitize is by looking at well digitized designs in software. By including the BE working file – you’re not just looking at stitches, you can actually look at the object! An important thing to learn about embroidery digitizing is that you have COMPLETE control over what you create. If you don’t want stitches some place – don’t put them there! Sounds simple, right? 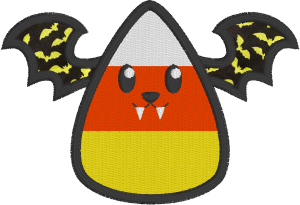 Tiffany has created the applique wings using the “None” finishing stitch type so that the satin border of the wings does not create a bump under the filled stitches of the candy corn. She uses a satin border after BOTH applique position and materials stitch out. So if you are trying to achieve something similar in your designs, check out her working file to see how this is effectively set up in the BE working file. We hope that you enjoy this design and use it to embellish some not-so-scary Halloween projects! We would love to see your creations using this design!! Click here to send us your photos of your projects to have them featured in the Embrilliance project blog! Enjoy! Posted 6 months, 2 weeks ago at 7:42 pm.